I have been making Paella for many years. Today I am making a Paella for 12 people. I will be cooking the Paella outdoors on my Paella Burner. My Paella pan is 21 inches in diameter measuring from the top edge of the pan. This size pan should feed between 8 and 12. It is my experience that the amount of rice plus other ingredients always feeds more people than indicated. I bet when we are all said and done for this group I will have plenty left over. Here is how to make Paella, step by step. Figuring out the exact liquid needed must be accurate. You blow your ratio of liquid to rice and the Paella dish is not likely to be pleasing to your crowd. I use Spanish Bomba rice. Figure one third cup of Bomba rice per person. Bomba rice requires three times the amount of water. This means for every person I need one cup of liquid to go with the 1/3 cup rice. I need to measure out 12 cups of chicken broth for this dinner. 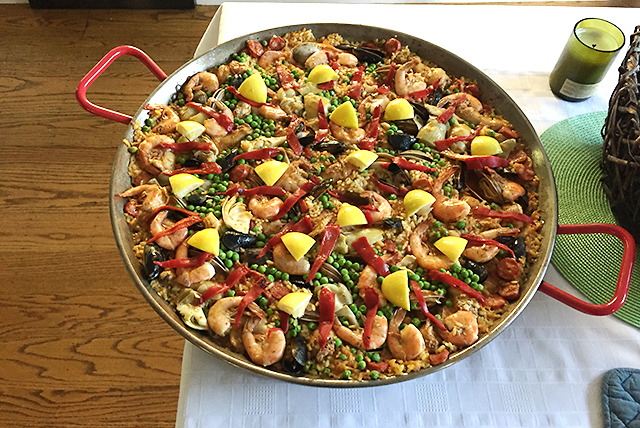 Other Spanish rice for Paella, like Valencia, uses a 1/2 cup of rice to a cup of water per person. I make a sofrito for the Paella a day or more before. It takes two hours to make a good sofrito. There are plenty of sofrito recipes on the Web. I use one that I found in César’s Cookbook: César: Recipes from a Tapas Bar. It calls for four white onions, four cups of diced tomatoes, 4 garlic cloves, and a teaspoon of saffron. Caramelize the onion in 1/4 cup of olive oil for one hour using low heat. Add chopped garlic and cook another 15 minutes. Add diced tomatoes and saffron, cook another 1 hour. This makes two to three cups. I freeze whatever I do not use. A Spanish chef once told me that the sofrito is the key to a fragrant Paella. 2 cups of artichoke hearts, rinse. * My local meat shop special orders a meaty size drumette for us. Season the chicken with salt and pepper. I cook the drummettes in the oven on a cookie sheet for 30 minutes at 375. They will finish cooking in the Paella. 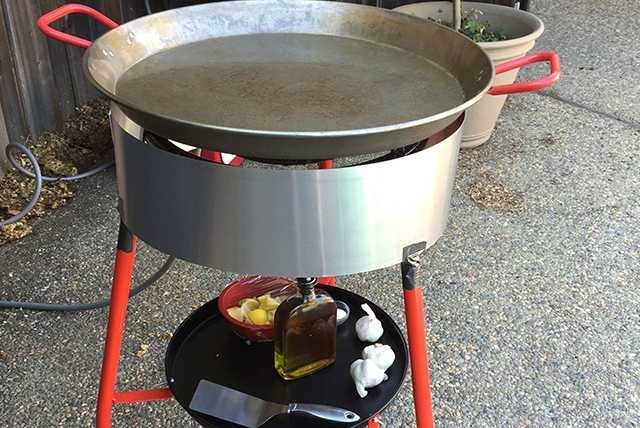 Strong winds or a breeze with blow out the flame on your Paella burner. On a windy day, you must have a wind shield for your Paella Burner. You can buy these on the Web but it is just as easy to make your own. I purchased the flashing in the photo below at Home Depot. 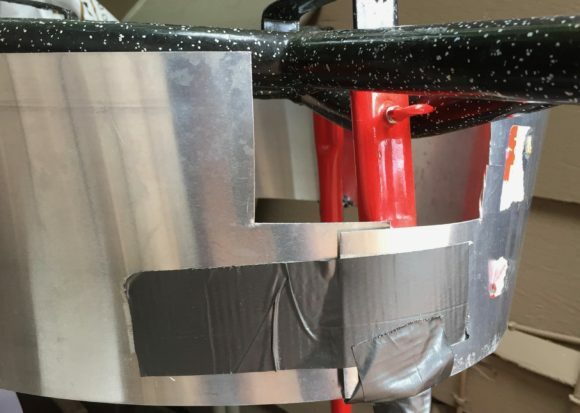 I used duct tape to attach the flashing metal to the Paella burner. Total cost $20. As you can observe, nothing fancy but it works and costs just a few dollars to make.